This tutorial illustrates how to use the AD unit to run a Pavlovian aversion learning test with adult zebrafish using 2 colour (or black and white check and grey) stimuli and a mild shock. The video below demonstrates how to set up the AD unit to run a Pavlovian aversion learning test experiment. The tank is set up with 4 arenas, for 4 singly housed fish, with mild shock plates. A brief introduction to a test script outlines how you can lay out the script with the four different periods, habituation, baseline, shock, probe. The short experimental test illustrated below, demonstrates the kind of data that you can collect in real time. In this demo two fake fish, singly housed in two arenas, swim over two different coloured zones. You will note that fish 1 (in Arena 1) prefers the green zone. The zanscript for this experiment included commands to collect data on the movement of each of the two fake fish in two different coloured zones in their arenas, during two intervals (periods), and detailing the distance travelled (measured in pixels) and time spent (in seconds) in each zone as well as counting the number of times the fish entered each zone. This .csv file illustrates how the data can be presented in real time. 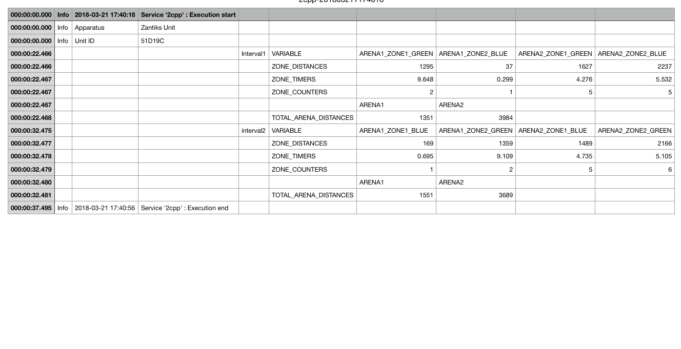 The screenshot below shows how the data in the .csv file imports into a spreadsheet, in this case Numbers.